The extra-wide opening offset model is ideal for securing drain nuts on sinks and tubs. Thin, smooth jaws slip into the tightest places. 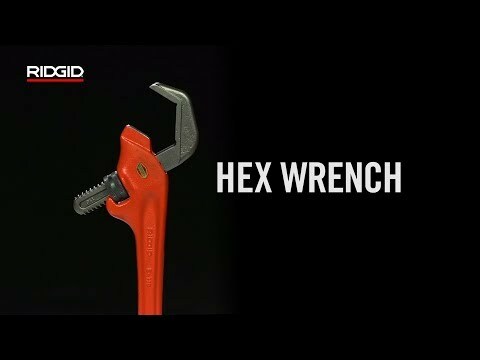 Hex Wrenches is rated 5.0 out of 5 by 4. Rated 5 out of 5 by JSparks from Very Nice Smooth Jaw Pipewrench This wrench is nice due to the smooth jaws and positive engagement around the fittings. A must have for Hydro Techs. What is the actual maximum opening in inches (rather than nominal pipe sizes) of Model 17 and Model 25 hex wrenches? Please see specs below. Model 17 has 3/4&quot; minimum and 2 3/4&quot; maximum opening. Model 25 has 1 3/16&quot; minimum and 3 1/8&quot; maximum opening. What is max &amp; min opening in inches (rather than nominal pipe sizes) of Model E-110 hex wrench?